Meet Cindy Socks, an adorable plush from the Bearington Collection who likes this basket so much she a home in every one we make. Cindy and all these sweets, what's not to love? They will treasure this very special gift that is reminiscent of the Christmases of yesteryear. 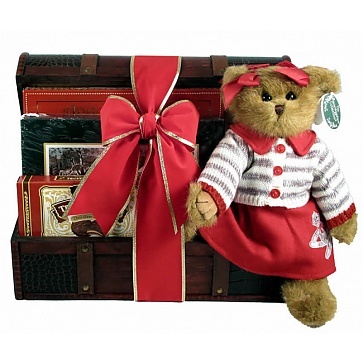 It includes an adorable teddy bear and lots of delicious sweet treats all arranged in a handsome wooden trunk!